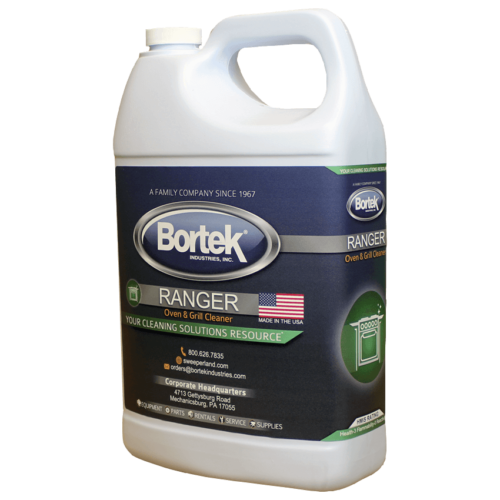 Ranger- Oven & Grill Cleaner- Bortek Industries, Inc.
A fast acting odorless cleaner for the removal of grease, oils, and carbons from ovens, grills, hoods, vents, deep fat fryers, griddles, etc. Designed to be sprayed or brushed on surface for rapid, easy cleaning. Works best on warm surfaces. Dissolves deposits quickly for easy removal by wiping or rinsing. FOR OVENS: For best results, heat to approximately 200°F, then turn off. 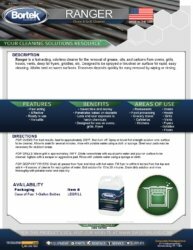 Spray or brush full strength solution onto surface to be cleaned. Allow to soak for several minutes, rinse with potable water using a cloth or sponge. Steel wool pads may be necessary for stubborn areas. FOR GRILLS: Warm grill to approximately 150°F. Dilute concentrate with equal parts water and pour on surface to be cleaned. Agitate with a scraper or aggressive pad. Rinse with potable water using a sponge or cloth. FOR DEEP-FAT FRYERS: Drain all grease from fryer and rinse with hot water. Fill fryer to within 4 inches from the top and add 4 – 6 ounces of cleaner for each gallon of water. 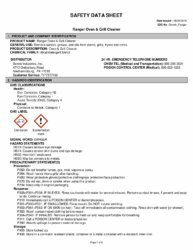 Boil solution for 15 to 20 minutes. Drain dirty solution and rinse thoroughly with potable water and wipe dry. Weight per Gallon 9.07 lbs./gal.